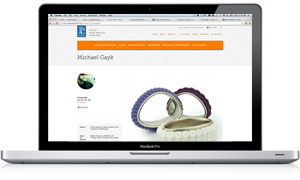 SNAG’s Maker Profile Pages are a professional marketplace designed for consumers, editors, industry professionals, gallerists, employers and others to find professional quality jewelry and objects that excite and engage. They are also a research tool for artists, curators, writers, academics, historians and others. How do I Get a Maker Profile Page? If you are already a member, visit “My Account” and click Edit Your Profile. If you are not a SNAG member, join now. Search SNAG’s Maker Profiles for exciting, engaging jewelry and objects made by our professionals. The Maker Profiles are an easy and accessible portal to an ever-changing gallery of one-of-a-kind, limited edition, and multiples. Search by an artist’s name, by materials, process, content or even location. From the classical to the daring to the modish. For fashion designers, editors, photographers and stylists working with models; if you walk the red carpet or coordinate one behind the scenes; for curators, gallerists, retailers wanting to capture a new clientele; people who want something that conveys their values and who they are. Each maker’s page includes images, bio, experience, techniques, awards, where to find more work and links to their website or online stores where you can purchase the pieces. Our Profile Pages are different — they are expertly constructed, devoted to craftsmanship, detail, quality and designed to last. Join SNAG or go to your account for a Maker Profile today.